Patrick Peterson has emerged as one of the top NFL players after becoming a standout DB at LSU. Week 1 of the college football season, with huge upsets and thrilling finishes, already has come and gone. If that wasn't enough for you, fans can now turn their college rooting interests to the NFL, where the New England Patriots and Kansas City Chiefs opened the season Thursday night with a 42-27 Kansas City win. RELATED: Which schools were represented most in 2016? (Our list includes players on active rosters, injury reserved lists, practice squads and the commissioner’s exempt list). This list was updated from the initial published date to relfect a change for Louisiana State. 1. LSU: 51 — The Tigers are the lone program to reach the 50-player mark. Although LSU hasn’t fulfilled its national championship aspirations in 10 seasons, a lot of talent comes through Baton Rouge, and purple and yellow still runs deep in the NFL. LSU has produced elite talent on both ends of the ball with the likes of defensive backs Patrick Peterson and Tyrann Mathieu (Arizona Cardinals), as well as star wide receivers Odell Beckham Jr. (New York Giants) and Jarvis Landry (Miami Dolphins). Look for rookies Jamal Adams (New York Jets) and Leonard Fournette (Jacksonville Jaguars) to make immediate impacts as well this season. T-2. Florida: 45 — The Gators snag a tie for second on this list with a mix of key members from Florida’s national championship teams in 2006 and 2008 as well as a bunch of newcomers. Joe Haden (Pittsburgh Steelers), Maurkice Pouncey (Pittsburgh Steelers) and his brother Mike (Miami Dolphins) were members of the Tim Tebow era while young stars like Mike Gillislee (New England Patriots), Vernon Hargreaves II (Tampa Bay Buccaneers) and Jordan Reed (Washington Redskins) have developed into solid players at the next level. Mike Gillislee (23) ran for 20 touchdowns during his time at Florida from 2009-12. T-2. USC: 45 — For the better part of the 2000s, USC has been a major player in college football, so it's no surprise that the Trojans have deep roots in the NFL. 2002 Heisman Trophy winnerCarson Palmer (Arizona Cardinals) is still one of the league’s top quarterbacks, while Clay Matthews (Green Bay Packers) and Brian Cushing (Houston Texans) have become cornerstones in their respected defenses. Dallas Cowboys left tackle Tyron Smith, who’s arguably the best lineman in the NFL right now, anchored the Trojans line in 2009 and 2010. T-4. Alabama: 44 — Though Alabama might not have the most players on NFL rosters, there’s no doubt that coach Nick Saban has produced some of football’s brightest young stars. Amari Cooper (Oakland Raiders), Landon Collins (New York Giants), Julio Jones (Atlanta Falcons) and Don’t’a Hightower (New England Patriots) have already emerged as top players at their respected positions and were all part of the Crimson’s Tide’s run of of four national championships in eight seasons. 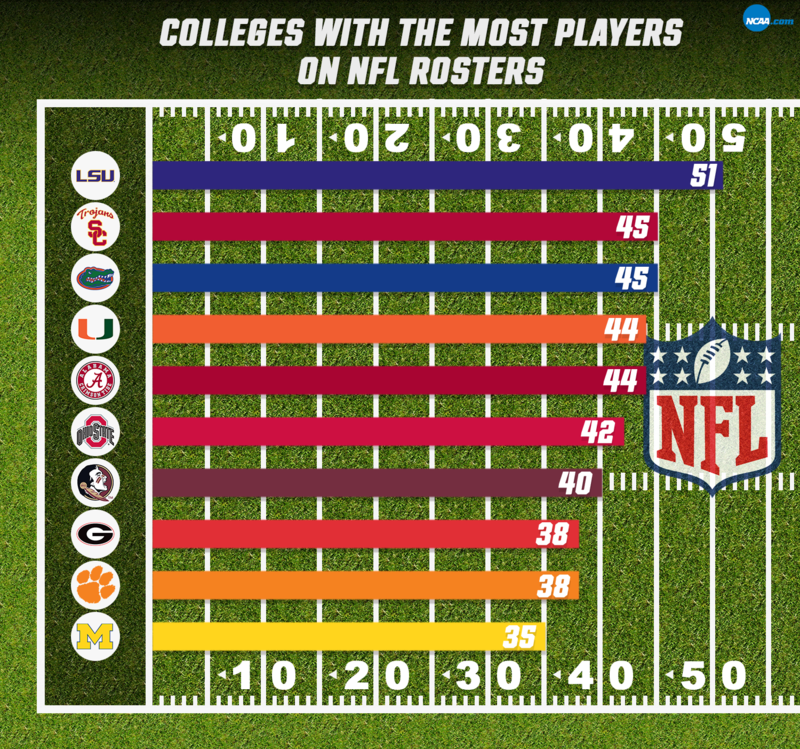 In this year's NFL draft, Alabama produced four first-round picks and nine of the top 100. Julio Jones was a star receiver for the Crimson Tide from 2008-2010. T-4. Miami (Fla.): 44 — The Hurricanes haven't been quite the same national championship contenders like they were at the turn of the century, but Miami still has talent scattered up and down NFL rosters. The Canes have produced offensive standouts like Greg Olsen (Carolina Panthers) and Lamar Miller (Houston Texans) while veterans Frank Gore (Indianapolis Colts) and Jimmy Graham (Seattle Seahawks) continue to produce in their respected systems. Olivier Vernon has emerged as a standout defensive end for the New York Giants while 2015 first round pick Phillip Dorsett is looking to make an impact on the New England Patriots.